Saint Valentine’s Day, commonly shortened to Valentine’s Day, is celebrated every February 14 in honor of a Christian martyr named Saint Valentine. Tradition dictates that this is the day on which lovers express their adoration for each other by giving flowers, chocolates, and greeting cards. This romantic holiday was first established by Pope Gelasius I in 496 AD. Modern Valentine’s Day symbols include the heart-shaped outline, doves, the child-god Cupid, and Teddy Bears. Japanese street artist, Shin Tanaka, is well known for his paper toy creations. For the month of February, he created the heart-themed design for his Br model figure. Br in this case is pronounced as Bear. The pattern itself sports two designs, one has a commercialized layout full of sugary-sweet, pink heart shaped outlines and the other one has an urbanized concept, complete with bling-blings and sneakers. I personally LOVE the tag feature, similar to the ones you can find on any stuffed toy, only this one is made of paper. As a bonus, designer Andrew “Greenelf” Loveland of Nice Paper Toys shared with me his two re-colored variations, one in purple and the other in baby blue hues. AAaawwWW, I think my blood sugar just went up the roof. 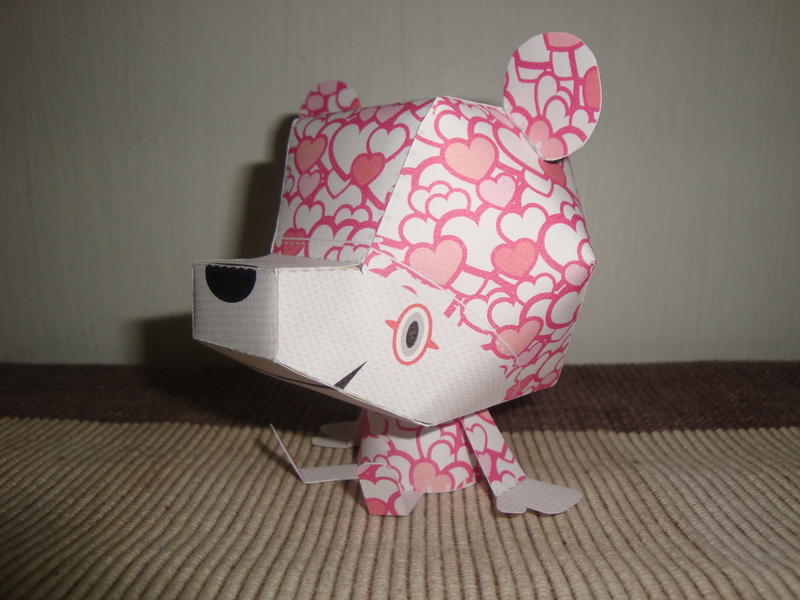 If you want to try assembling this paper model, you may download the pattern and instructions at the Shin Tanaka website [click here]. As for the two re-colored models, you may have to check out the Nice Paper Toys website [click here], and ask for his permission first.